Early leader is Wild Oats XI together with Black Jack, Infotrack and Comanche, covered by six nautical miles after almost eight hours of racing. After clean starts on all three lines, the Oatley family’s Wild Oats XI and Peter Harburg’s Black Jack were neck-and neck, while InfoTrack and Sun Hung Kai Scallywag gave chase and Comanche made a swooping tack to the east of the Harbour. Black Jack’s skipper, Mark Bradford, then put the foot to the accelerator to see the Queensland boat leave her rivals behind for the right hand turn at South Head for Hobart. 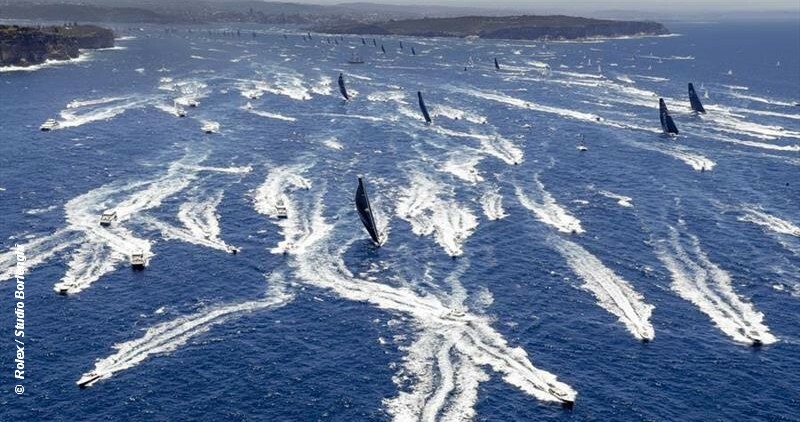 Despite fairly benign running conditions in the Cruising Yacht Club of Australia’s Rolex Sydney Hobart Yacht Race today, four yachts have retired from the 628 nautical mile race. Gordon Ketelbey’s recently purchased TP52 Zen reported damaged rigging and was heading to Wollongong. David Witt skippered super maxi Sun Hung Kai Scallywag, owned by SH Lee, of a broken bowsprit, forcing the Hong Kong entry’s retirement. Patriot has retired with rudder damage. M3 Team Hungary – Retired – Dismasted. The fleet is now at 81 with international entries reduced to 10 and super maxis down to four.